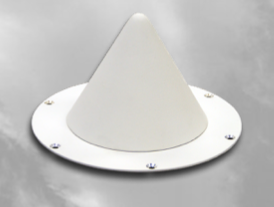 The AS-48917 omnidirectional antenna provides superior circular polarized RF performance over both the L1 and L2 GPS Frequency bands. RF design configuration is a two-arm conical log-spiral radiating element fed at the tip by a compensated balun. The spiral cone angle and the tip and base diameters were selected to provide satisfactory operation over the operational frequency band. The complementary two-arm spiral is wound to provide an inherent circular polarization. This results in broad-lobed unidirectional circularly polarized radiation off the small end or apex of the cone. It is ideal for application where hemispherical coverage is required. The antenna is optionally provided with a nine-inch diameter ground plane (as shown in the photograph above). The mechanical configuration of the antenna incorporates materials and construction techniques which yield high reliability and low outgassing required for space operation.